Like any other business, gold production is also not free from obstacles. This activity is often full of hindrances during the initial stages. With proper guidance of a trusted partner and using well-proven strategies, it is possible to emerge out as a winner. Start Your Own Gold Mine has experience and its mentor has already established over 100 business companies and turned them into profitable ventures. With us you can reduce the burdens of exploration, self-learning and prolonged trials. With our help and guidance you can kick-start your gold mining business and get going in just 45 days upon your arrival. Getting you to learn how to manage your own gold mining business. You will need to spend one to three months to learn the business. We will make sure that you produce your first quantity of gold and be able to control and manage your gold mine all by yourself. Running your own gold mine under our supervision and management. Once you have produced the first quantity of gold our consulting fee will be paid after you get into profits. It can be a small share of the produced gold or an equal amount of money as agreed and laid in the final contract. After this, you may opt to run your gold mining business all by yourself or entrust the management to us. If you choose us to manage your gold mining business, you would be entering into a joint venture with us, where you would be getting the larger share and we would be getting the smaller percentage for managing your gold mine. 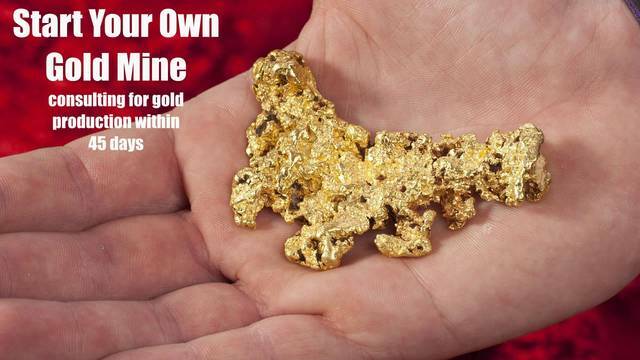 Start Your Own Gold Mine is currently operating in Tanzania. We have considerable experience about the rules and regulations of the country. We may help you outright from deciding the locations to running your business.